In 1928, Elsie Driggs took a trip to the Ford Motor Company’s Rouge factory in Detroit. This was back when it was the automobile capital of the United States and not the rundown, infamously impoverished major city it is today. Upon arrival, she ran a flight on the company’s Tri-Motor Plane. 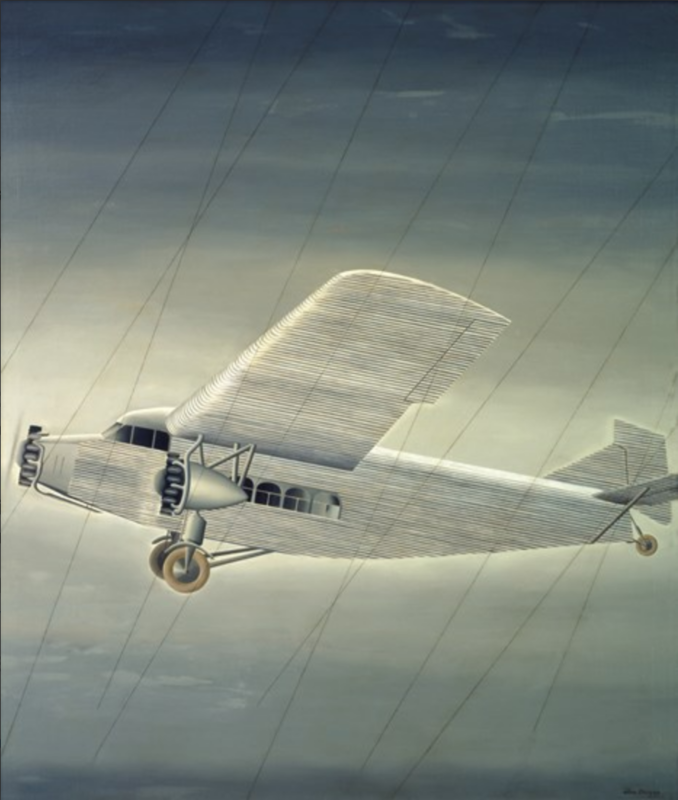 Thus began the love story of Driggs and the Aeroplane, and the main inspiration for this painting. Inspired by Cubism’s multiple perspectives, Futurism’s celebration of technology, and Purism’s emphasis on clarity, Precisionism was the first natively born American art movement. Unlike the natural, organic structures and landscapes that the Europeans took inspiration from, Precisionism was fascinated by the advent of automation, of machines, roads, and skyscrapers carefully built to the inch and bolt. Call it a machination fetish at your own peril. Unlike most art movements, the artists never met together and collectively forged a manifesto. They each came to their style and rules independently of one another. Of the many members of this movement, Driggs was the only woman, herself the daughter of a steel mill worker and raised with a engineer’s vision. Those lines she drew, intersecting various parts of the aeroplane? They loosely mirror the lines found in schematics for the assembly of vehicles, land or air-based. Although at first glance the painting seems more real than abstract, look further. The whole piece is flat in perspective save for the wheels, once again reminiscent of the isometric view of a blueprint. Chip off the old block, huh? Murphy, Jessica. 2007. “Precisionism.” The Met's Heilbrunn Timeline of Art History. The Metropolitan Museum of Art. June 2007. https://www.metmuseum.org/toah/hd/prec/hd_prec.htm.